Our pathways to our Munanso lead through dense brush, and twist and turn so that it is not possible to see directly into the Munanso from the outside. The pathway is lined with various bushes, vines and trees, including thorn bushes and poison ivy vine. These both act as protectors of the pathway. Poison ivy is a notorious plant, while some people do not get a rash from it, even when handling it barehanded, most do, and some people get a rash from walking by it without even touching it! It also changes its potency at different times of the year. In summer it is a shiny green three leafed vine, in fall it changes to beautiful reds and oranges. It is an oil that it releases that is the poison. The poison ivy grows eventually to a very thick hairy vine, which is very potent and we use it spiritually for various purposes, year round. 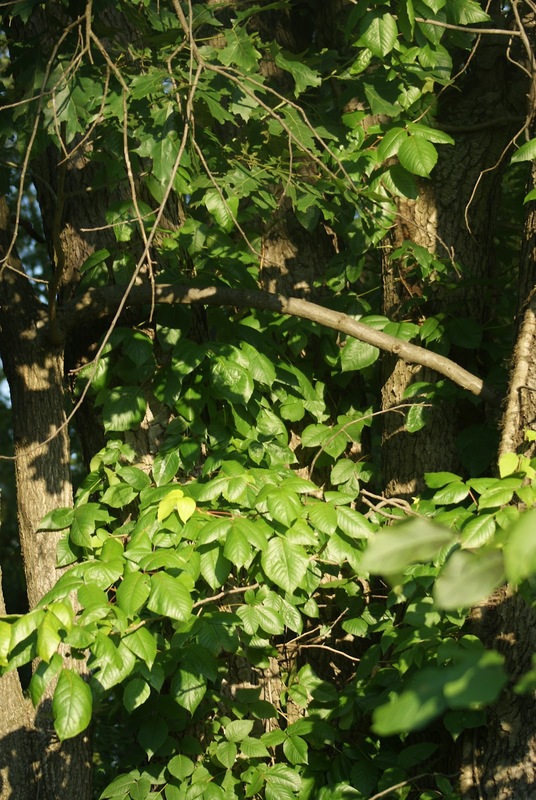 Poison ivy twines itself up trees and can reach high up into the branches. Looking at the tree it is easy to mistake the poison ivy for the tree leaves. Poison ivy may at first appear as a one dimensional "poison" however it has various properties that allow us to understand that it is a very multi-dimensional plant. Historically it was used by Indigenous people of this country to develop immunity to it, they would do this in a "homeopathic" way by ingesting small amounts to trigger the body to develop immunity. This resulted in the vast majority of the population being immune to this vine that they would have undoubtedly encountered all around. This is significant to us as Paleros and Tainos because this poison ivy at our pathways "allows" the Indigenous Spirit through, but stops the spirit of colonialism, imperialism and all the other -isms in their tracks. Today there is a homeopathic remedy made from poison ivy called Rhus Tox, which is highly useful. Another aspect of poison ivy is that human beings are the only ones allergic to the poison ivy. Goats in particular love to eat poison ivy, and certain species of birds feed on its berries in the winter when food is scarce. Again, poison ivy "allows" in all the animal Spirits and bird Spirits, only stopping those human Spirits who hold the thinking that those things that do not benefit them should be annihilated, (usually with round up). Not only did the Indigenous People of this country utilize the poison ivy to develop immunity to it, they also utilized it to make baskets, and (we have heard) as a remedy for ring worm. So it did have beneficial properties for people who were NOT engaging genocidal approaches to Mother Earth's children (Plants, Animals and People!). It is fascinating to us to notice the various changes from year to year that our Spiritual Spaces undergo, and to gain wisdom and knowledge in the pursuit of understanding why these changes are occurring. At this time the Land here is leading us on a trail of transforming our thinking concerning care taking Land, especially with regard gardens and our Ceremonial Spaces. Many years ago we would have launched a painful process of trying to remove the poison ivy, however at this point we have come to the realization that things appear for a reason and that Mother Earth is always seeking Balance and Healing, and so we are much more open to her need for the poison ivy, and the Spirit of the Munanso's need for the poison ivy, so that we can also understand our need for the poison ivy, and learn to live in harmony with it, and learn to use it for protection and within the processes of healing for others. Knowing even a little bit of the "story" of a particular plant, guides us greatly in our own discovery of the uses of that plant!